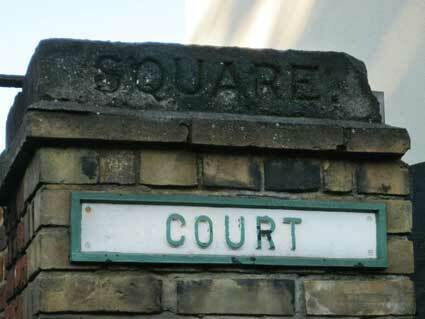 In 2012 this slightly puzzling piece of lettering stood to the right of the busy entrance to Woodbridge Road Medical Centre, at 165-167 Woodbridge Road. It should be borne in mind that the date attributed to a map is usually that of publication; the data upon which the map is based is usually one to two years earlier than this. 1. 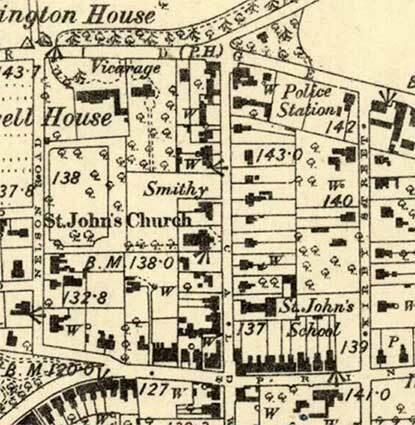 On the undated map (above), 'St Michael's Vicarage' is clearly labelled at no. 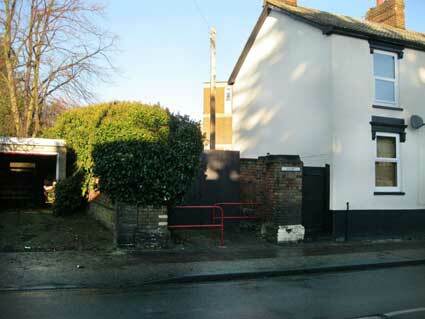 167; it looks as if the cart entrance accessing the rear garden was original – until recently it was used as an access to a patients' car park behind. The 2017/18 conversion back to dwellings has filled in this entry to form part of the building with a new front door. The doctor's 'Surgery' (no. 165, semi-detached with 167) is shown; it later spread into 167. Note that Harmony Square doesn't seem to exist at this time, although the shape of the site is there – See the following maps. 2. 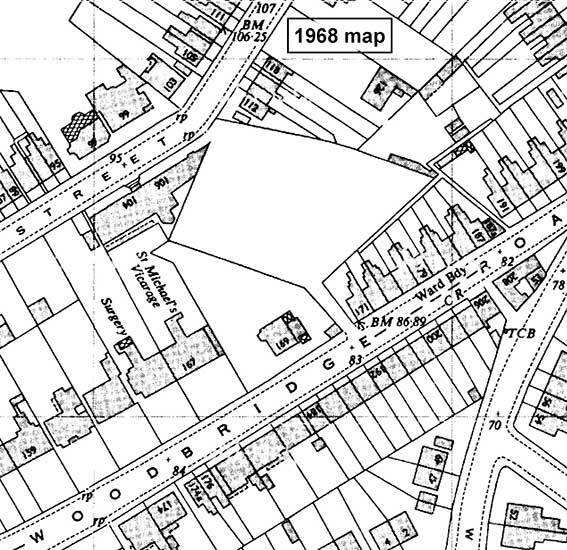 We now have a sequence of maps of this area dated 1952, 1968 and 1969. The first labels no. 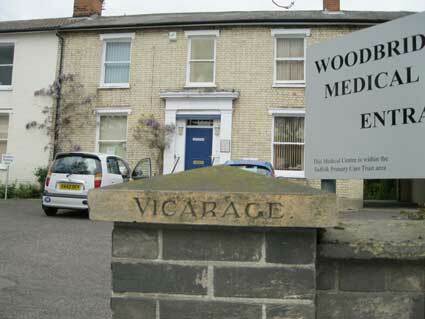 167 as 'Vicarage'; the second and third have the full 'St Michael's Vicarage'. The dramatic change occurs between 1968 and 1969 when the easterly Whitfield King offices in Lacey Street are demolished and the former Harmony Square cottages are replaced by the Hanover Court flats. This accounts for the void in the Harmony Square footprint. The offices of the Whitfield King stamp business are described and illustrated on our Morpeth House page. 3. 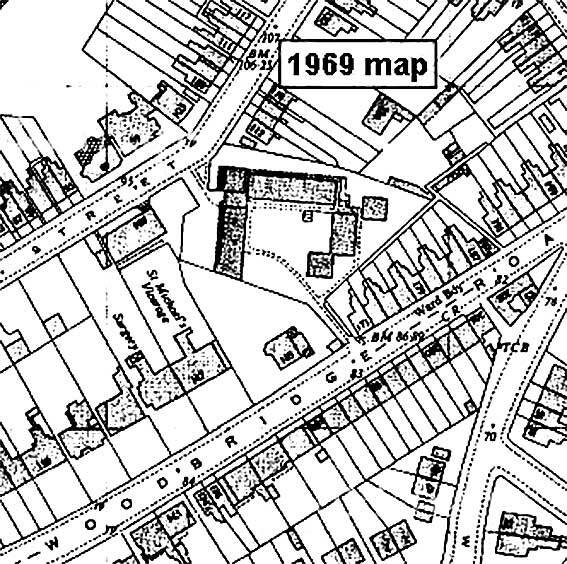 The 1969 map (below) clearly shows the layout of the present-day Hanover Court; the Whitfield King offices at 106 Lacey Street have been removed, presumably to facilitate vehicular access to the awkwardly-shaped sheltered housing site. 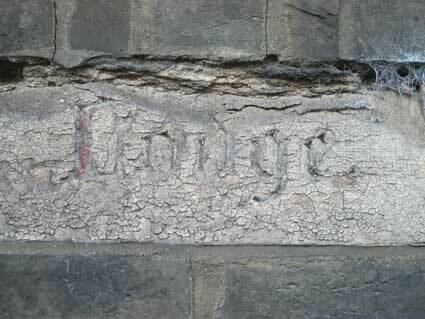 'St Michael's Vicarage' is still clearly labelled at this time, as is the next door 'Surgery'. When it ceased to be a vicarage, presumably the surgery next door bought no. 167 and spread its operations to both (linked) buildings, until the 21st century conversion back to dwellings. 4. Harmony Square was built during the Napoleonic Wars (1803–1815) for military officers, as described below, and the Church of St Michael in Upper Orwell Street was not built until the 1880s. 5. The Ipswich Society Local List (second edition 1985, see Reading list) describes both houses in Woodbridge Road as 'mid-19th century' (no. 165 as 'Doctor's Surgery'; no. 167 as a 'Private House'). So the 'Vicarage' ceased to fulfill that role at a date between 1969 and 1984. 6. Sources state that one of the cottages in Harmony Square suffered bomb damage during the World War II but it was repaired (see our Warwick Road page), however the whole group of dwellings and the mission room were demolished in 1957 and flats, now called Hanover Square, were built on the site – see photographs of the entrance below. It appears from these maps that, following the demolition the site lay empty for about twelve years, before redevelopment. 7. Given that there was not another Church of St Michael in Ipswich – according to Simon Knott's Suffolk Churches site (see Links) – the 'Vicarage'-lettered capstone is a 20th century addition (it certainly looks more modern than its heavier Victorian counterparts). That would fit in better with Suzanne's information (see the update 16.2.2015 above) about a vicar living at no. 167 in 1933 and with the later date of the map. 8. 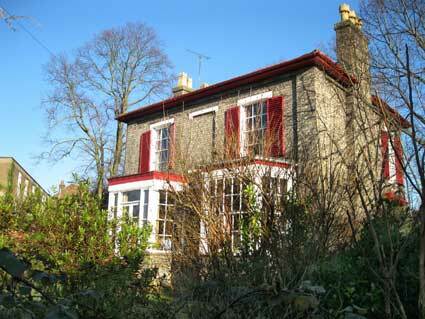 Why build a vicarage about a mile away from the church? Our imaginary vicarage nestling a hundred yards away from the village church doesn't hold true in a large town. For example, Rev. J.T. 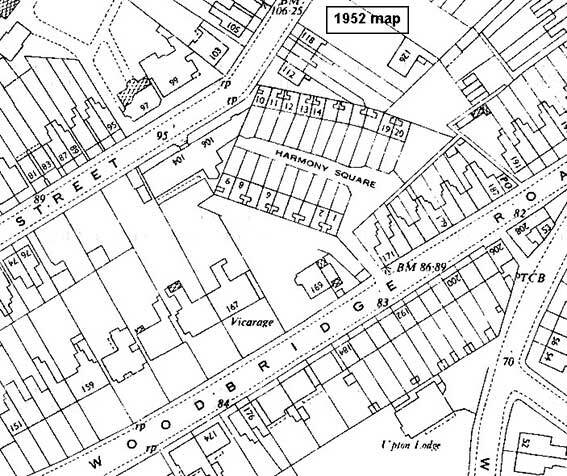 Nottidge, incumbent of St Clement Church, not only had Holy Trinity Church built in Back Hamlet at his own expense, his Trinity Vicarage was a long way up Bishops Hill in 'Vicarage Road', later an extension to Rosehill Road (as shown on our Rosehill case study page): a much more salubrious location. 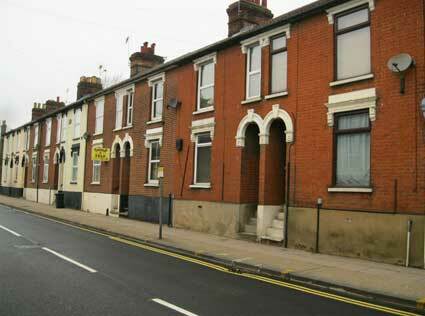 On the pavement close to Farringdon Villas is an Ipswich Corporation Electricty Dept. Mains Disconnecting Box set into the pavement; see our Street furniture page. 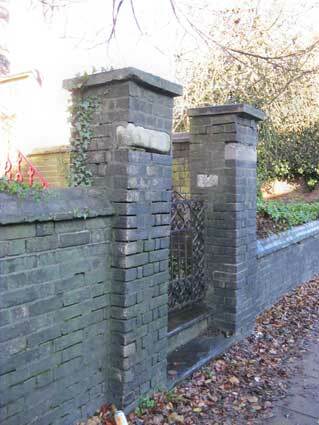 The brick gate posts from Woodbridge Road to St John's Lodge have stone insets bearing recessed gothic lettering infilled with red and/or black on the right. 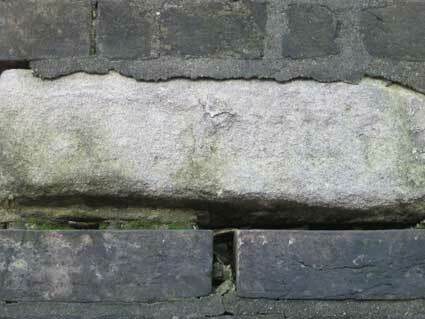 'St John's' to the left is much weathered, hardly visible except in raking sunlight or, we noticed, by the street light at night. 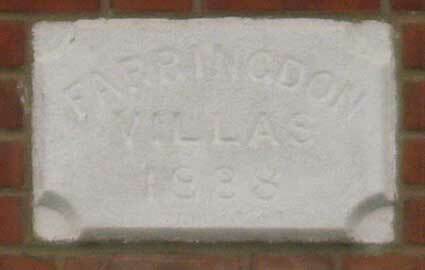 Is it possible that St John's Lodge on Woodbridge Road relates to St John the Baptist Church a mile or more up the road on Cauldwell Hall Road, which in turn gives its name, 'St John's', to the area still known to some as 'California'? The 'P.H.' on the corner is The Golden Key, now converted into a grocery store. Between the two is the modern petrol station and car wash. While Nelson Road is present, it is still sparsely developed. 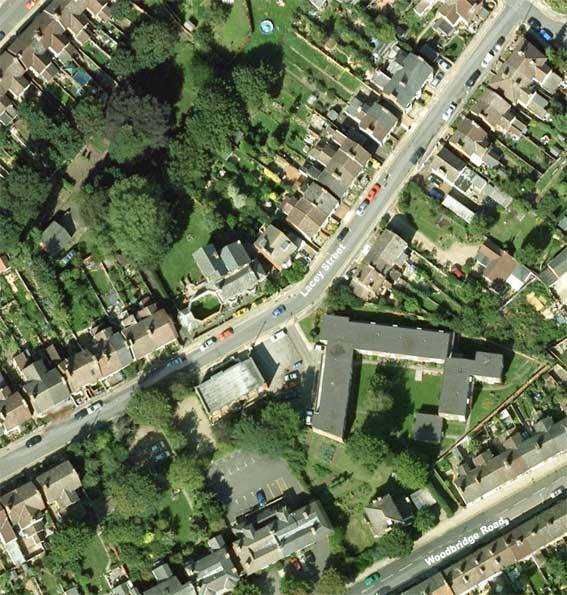 Gordon Road which leads down to the Roundwood Bowling Green (behind the Vicarage) is yet to be built. 'Cauldwell House', the larger building to the left of the Vicarage, no longer exists and Roundwood shops now line Woodbridge Road. During the preparations for the Napoleonic Wars (1803–1815) a militia camp was established on the level ground up Albion Hill (see Parade Field Terrace) with the officers’ quarters in Harmony Square opposite the Duke of York public house. 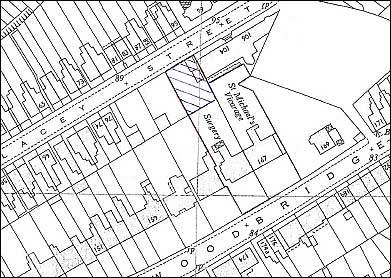 Harmony Square consisted of two rows of single bedroom cottages facing each other across an open courtyard: eleven on one side and nine on the other with a wedge-shaped Mission Room at the eastern end, hard up against the back yards of Connaught Buildings (see above). One of these cottages suffered bomb damage during the Second World War but it was repaired, however the whole complex was demolished in 1957 and flats, now called Hanover Square, were built on the site. For the story of a large WWII bomb hitting Harmony Square and a second in the garden of nearby Derby Lodge, see our Warwick Road page. Luckily, neither exploded. 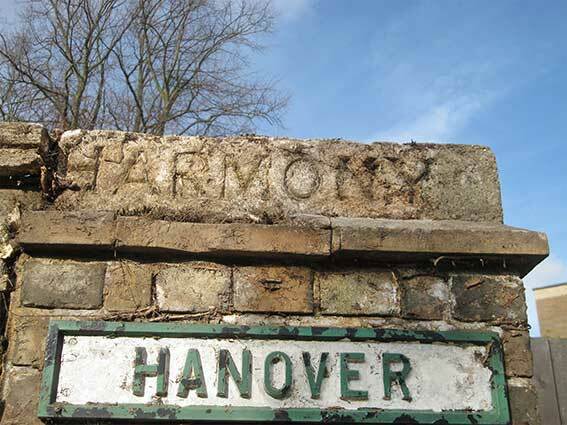 Below: 'HARMONY' is readable in this enhanced image with the metal nameplate 'HANOVER' beneath. 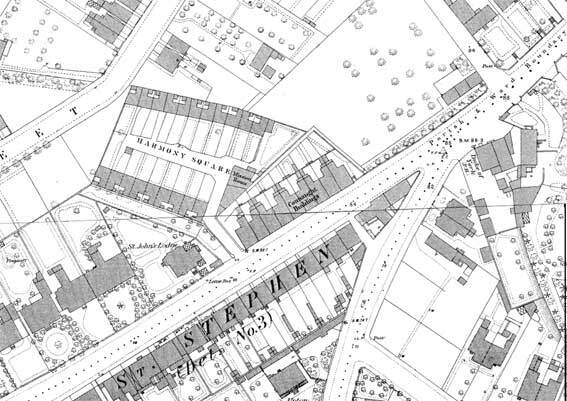 It is of passing interest that a 'Letter box' is shown outside St John's Lodge on the 1883 map. It certainly is not there now. 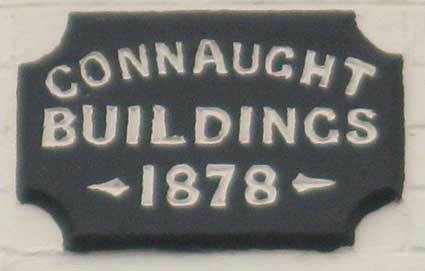 However, in 1887, thus not shown on the map above, Connaught House was built a little way up from Connaught Buildings on the corner with North Hill Road. 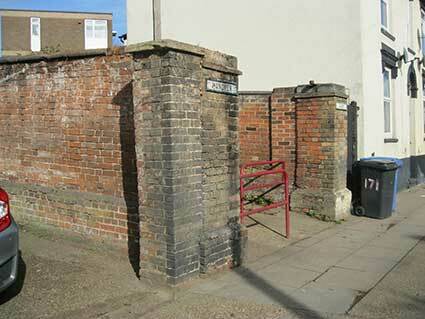 For many years it was a sub-post office and it still bears a defunct wall box shown on our Street furniture page. This bird's eye view of the area shows the present day situation. Morpeth House, former home of the Whitfield King stamp empire in Lacey Street, is slightly left of centre (the roofless, octangonal former billiard room is noticeable). 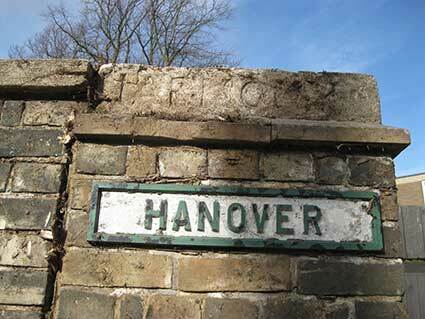 The Hanover Square flats sit at 45 degrees to Woodbridge Road.